A Year of Being Here: Barbara Crooker: "Rufous-Sided Towhee"
scratches in the underbrush, searching for food. the understory, the margins, the hedgerows. "Rufous-Sided Towhee" by Barbara Crooker. Text as published in Little Patuxent Review: A Journal of Literature and the Arts (Winter, 2014). Reprinted by permission of the poet. Listen to the "drink your tea" song of this bird (scroll down page to the audio bar). 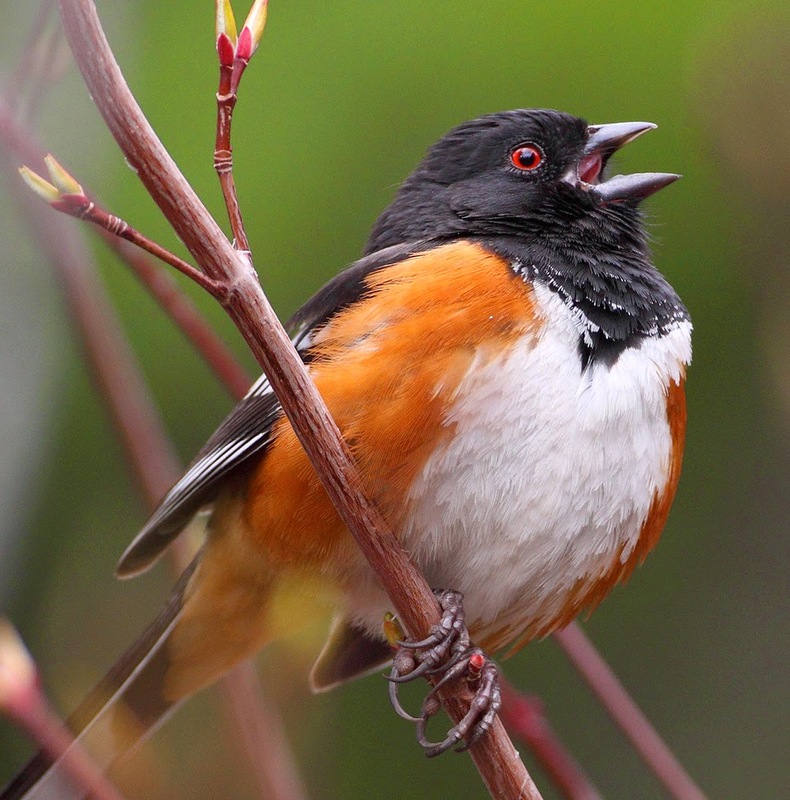 Art credit: Untitled photograph of Rufous-Sided Towhee by Pat Gaines. Love the poem! Can't find the audio bar...? Another splendid poem by the inimitable Barbara Crooker, whose work I've admired for decades. Barbara is quite a poet, and extraordinarily generous. Tom Hennen: "Spring Follows Winter Once More"
Robert Bly: "Climbing into Bed"
Yehuda Amichai: "I, May I Rest in Peace"
Susan Terris: "Matin and Vesper"
Holly Hughes: "Mind Wanting More"
Thomas Merton: "Song for Nobody"
John O'Donohue: "For the Traveler"
Les Murray: "The Meaning of Existence"
Kay Ryan: "Why We Must Struggle"
Rhoda Neshama Waller: "Spring Comes to Maine"
Harriet Brown: "After a Miscarriage"
Sharron Crowson: "Prayer for Another Sunday"